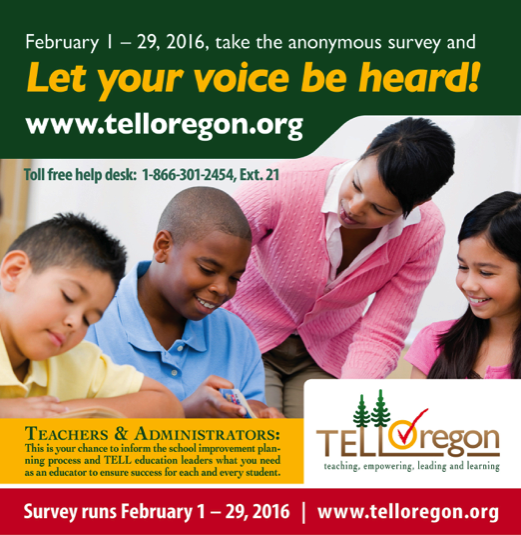 The TELL Oregon 2016 Survey will now be available until midnight Thursday, March 10, 2016. The decision to extend the deadline was made Wednesday, February 24, 2016 with the hopes to allow all who are interested to participate in the survey. The survey provides critical information to schools, districts, and the state about what our teachers and administrators need in order to most effectively support each Oregon student in fulfilling their full potential. Well over 13,000 school-based teachers and administrators have already participated in the survey. COSA and TELL Partners encourage all who have not yet participated, to work together with a local association leader to increase participation in the survey. Many schools with high participation rates have offered time during a staff meeting or PLC meeting for building personnel to complete the survey. School-level results are only available to schools where at least 50% of licensed staff members participate. It is important to make sure school numbers are over this threshold so school-level results can be received. Want to see what your current participation rate is? Click here to access current participation rates by school and district.